This Saturday night, the UFC’s most recent supposed wunderkind, Sage Northcutt, will fight for the first time on a Fox main card. This event will be the 18th UFC event on the network. Northcutt, who is currently ranked #133 at lightweight, will not be the lowest ranked fighter to ever compete on the network. That distinction belongs to Bobby Voelker who came in ranked #152 for UFC on Fox 8 in 2013. However, Northcutt’s fight against Bryan Barberena (#109 at lightweight) will be the lowest ranked bout to ever be part of a UFC on Fox main card. The following table shows the ten lowest ranked bouts to appear on the main card of a UFC on Fox show. Average rank is simply the average of the fighter’s rankings taken from that event’s Fight Matrix Program. As you can see, it is not particularly close. Saturday’s fight will be the first Fox bout to feature two fighters with triple-digit rankings. In fact, Northcutt and Barberena are two of the four lowest ranked fighters to ever grace a Fox main card. The following table shows the ten lowest ranked fighters to appear on the main card of a UFC on Fox show. There have been three #1 vs. #2 match ups on Fox: Demetrious Johnson vs. Joseph Benavidez (UFC on Fox 9), Rafael dos Anjos vs. Donald Cerrone (UFC on Fox 17) and T.J. Dillashaw vs. Renan Barao (UFC on Fox 16). The main card of UFC on Fox 18 will have the lowest average ranking per fighter on any event on the network. The highest ranked man card, outside of the first event which only featured one fight, was UFC on Fox 6. The card featured five fighters ranked in the top ten. 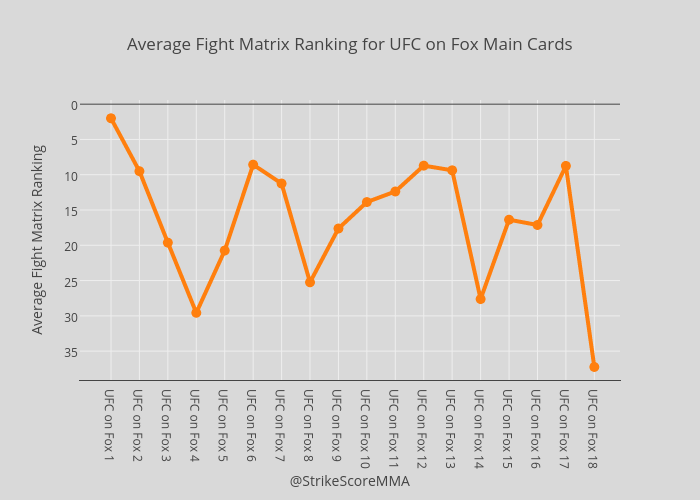 The following chart shows the average fanking for the main cards of UFC on Fox shows.